Adji Suryo-di-Puro* (the 38 years Curriculum Vitae in bahasa Indonesia), the Indonesian English-language international journalist (while secretly also a former 'James Bond' field operative) and Iranian-born Minou,the 22-year old girl like in the JB movies whom he married in the mid-60s unlike in the movies,are now living in Jakarta, Indonesia, after their East German and other adventures in Europe. A short concise description and history of the area, Jakarta and Indonesia, are given here. This web page plays the 'Moorea Island' MIDI file, sequenced (played) by Devian, a 30-year Indonesian graduate from the Berkely School of Music & used with permission. Most people are not aware that Indonesia is a major country of some 220-plus million people. It is the world's 4th. largest populated nation after China's 1.3 billion, India's 950 million, and the U.S.A.'s 265 million. It it is the world's largest – and youngest – populated nation with some 165 million youngsters under the age of 30 where only 8% are over the age of 60 years (national Bureau of statistics, August 2001, quoted in the English-language daily "The Jakarta Post", August 2001). It takes 7 hours to fly from Jakarta to Papua (Irian Jaya) in the east towards the center of Australia, (2 hours from Jakarta to the west to Kuala Lumpur, Malaysia, or 1 hour 45 minutes to Singapore both in the middle of Sumatra),and 4 hours from Jakarta to the west to the town of Sabang at the western tip of Sumatara as hundreds of thousands of domestic and international travellers will confirm. Think of sitting in a Boeing 747 jet for 10 hours continuous flight, that's equivalent to flying through Indonesia's vast territories. The area is so huge, that most Indonesians themselves do not know and are not aware of the many events.. both the good and bad ones.. that happen in the other parts of the country. To both nationals and international travellers, the publicity given by some governments that travel in Indonesia should not be included because of certain events, are ridiculous as these international visitors experienced themselves. It is like saying do not travel to the U.S.A. because there are riots in Los Angeles. New Yorkers probably are not even aware that riots did take place in L.A. if not for instantaneous television coverage. It is also just as ridiculous to tell people: Do not travel to France because there are riots in Belgium. 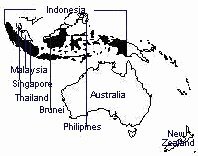 Besides, Indonesia's total flying distance is nearly twice the total flying distance of the U.S.A.-- and several times the total area of Western Europe! The international rockstars, like Westlife, the Corrs, the Rollingstone rockstar who married in Bali, international filmstars,international music and jazz festivals (e.g. JakJazz) and the hundreds of international exhibitions, that take place in Indonesia obviously do not believe in foreign government propaganda. Readers of this webpage should not believe in these negative propaganda either. The country is too big – think of the country as the equivalent distance from London to Tehran in Iran – BIG by any standards to be pegged like most other countries. Jakarta, its capital city, is the size of many small countries.. and just as modern as any of the world's metropolitans with many intelligent skyscrappers (regulating lighting, air conditioning etc. without any manual intervention, e.g. BNI, G.E. [General Electric] Building, etc.) and S.E. Asia's largest shopping complexes (Mangga Dua, Anggrek Mall & some 80 other malls). It is, according to the United Nation's population statistics, one of the world's five largest cities, after Mexicocity's 35 million, Shanghai and other Chinese metropolitans. At night, according to the Jakarta DKI City government surveys in 1997 and 1998, its population is 12 million; during the day it grows to 19 to 20 million people who travel to the city from the dozens of outlying satellite towns and leave, clogging Jakarta's internal city toll roads from 6 a.m. until 10 p.m. at night. It takes some 60 minutes to circle through Jakarta's circular internal toll road on concrete stilts over buildings, factories, and populated areas at a constant speed of 85-90 km (50-55 miles) an hour to arrive at the same point (visualize travelling through Hong Kong's populated areas, or London's Oxford Street and Hampstead Heath encircled by a toll road on conrete stilts). It's not like travelling through London's or Washington, D.C.'s circular roads where most of it consist of wooded and scaterred homes. Jakarta is now taking bids for the "second 'outer' ring road" covering its suburbs and satellite towns, somewhat like London's and Washingto DC's ring roads. Indonesia's Rupiah (rupee-aah) currency is where the dollar goes a long, long way, said movie star Brooke Shields recounting the story when she with her tennis champion husband, Agassi, played with the monkeys in Bali to U.S. television funny man, Jay Leno in September, 2001. The background image of this page is the "Batik", or bahan titik, which means material made out of dots, the process of making handmade batik cloth. The cool Island of Moorea MIDI file is playing, and is meant to set the mood when visiting the 17,508 tropical islands of Indonesia, where life is easy, where there is no rush. 'Moorea' Sequenced (played & arranged) by Devian, a 30-year Indonesian graduate from the Berkely School of Music & used with permission *These web pages were authored and created by a 60-year old former Indonesian U.S. Fulbright Grantee & English-language journalist at two of the world's largest international & Indonesian news agencie in the mid-60s in London, Paris, Cologne, Germany, former insurance underwriter at Loyds London, stockbroker at U.S., Swiss & German companies, university lecturer, consultant & adviser to the Indonesian State Secretariat (U.S. 'White House' equivalent) Soeharto Presidential Administration Office and businessman in defence, telecommunications and other fields in Indonesia & various countries for the last 38 years. Indonesia is the World's 4th. largest populated country after China, India & the U.S.A. in population terms - 220 million people according to the official 1997 census (but estimated to be 250-plus million in 1998, the population size of the U.S.A. when 16 years and under without I.D. cards are included). Aside from the world’s largest nation, it has a large Geographical Area to match. It has a geographic area of 5,600 kilometers in width, 3 time zones (it should have 4 time zones because Singapore and Malaysia which are in the middle of Sumatra are 1 hour ahead of Jakarta), or in real practical terms for the jet liner traveler a flight lasting 10 hours from east to west (versus 5½ crossing continental U.S.), an area straddling London in England, all the way to France, Holland, Germany, Spain, Portugal, Italy, Yugoslavia, Turkey to Tehran, Iran, to the borders of Egypt, the geographical distance which is Indonesia. It is the World's Largest 17,508-Island Tropical Paradise—with the world's longest 85,000 km coastline. The weather and temperature remain constant all year round from 19 to 32 degrees Celsius (66 to 89 Fahrenheit) and a humidity factor ranging between 40% to 91% depending on the area. It has 582 different ethnic languages and nearly as many different cultures unified by one language “Bahasa Indonesia” (spoken as the official national language by the folks in Malaysia, Brunei Darussalam & Singapore). Bahasa Melayu, a deravative of Bahasa Indonesia, is an Englisified version of Bahasa Indonesia, that is, its gramatical structure and way of expression uses the English language gramatical structure but expressed using the Malay tongue. Whatever it may be, Bahasa Indonesia is spoken by more than 220 million people compared to 1/10th. who speak the Malay language. It is One of the Founders of A.S.E.A.N. (Association of South-East Asian Nations), an area that was one of the fastest growing areas in the world. BALI (the Island of the gods) • KALIMANTAN • SULAWESI • IRIAN JAYA • SUMATRA • JAVA (the coffee-growing area where the Java Computer language got its name) several well known areas which make up Indonesia. (Right photo, Pura Bedugul, a Balinese temple). 25 Years Sustained Economic Growth, and an average 6 to 8.2% growth annually between 1990-97, which provides for confidence to achieve the same performance in the near future, although Indonesia is right now in 1997-99 facing an economic crisis. The “Big 5”–China, India, Indonesia, Brazil & Russia–represent more than 50% of the world population and will represent the “world's largest producers", and key players in the World Economy, according to a leading global infrastructure international publication. It is the world's largest youngest populated nation. It has a 75% Youthful Population–some 165 MILLION YOUNGSTERS–under the age of 30, according to the National Statistics Bureau in August 2001, people at its most productive years open to the good things in life, new products, new tastes and a new life style. Indonesian television programs, domestic and foreign computer and fashion publications (like Bazaar, Cosmopolitan), ways of speaking and expressing themselves, advertisements, all reflect this youthful population. A Huge official Market of 220-MILLION plus people, equaling the combined markets of England, France & Germany. Ready To take-Off and move as soon as the different infrastructures – power, roads & telecommunications – are in place, and as soon as it recovers from economic & political problems suffered throughout Asia, Eastern Europe and expected global recession of 1999-2000. Jakarta, the capital is as Modern as any of the World's Metropolitans and as large – reputedly one of the world's 5 largest cities. Jakarta's population is 18-20 Million during the day – the size of many small countries – and 12 million at night according to published reports by city officials who monitor suburbanite travel, and as Traditional & Cultured As You'd Want It To Be going back more than a thousand years like the Borobudur Temple in Jogjakarta. Indonesia's 220 million-plus people are blessed with vast natural resources, and with the exception of disturbances like El Nigno and the 1998–2001 Asian economic crisis, its people had a 25-year past performance record of economic growth, the last 10 years averaging 6% to 8% annually. For the expatriate community, Indonesia has provided more than 42 international schools operating across the country. Details of some of them are below. Before the 1998-01 Indonesian –Asian economic crises, Indonesia was one of world's fastest growing areas. To run and then transform it into one of Asia's economic tigers is akin to a miracle because of the Indonesia's 582 different languages and nearly as many cultures reflected in its national emblem "Unity In Diversity" (similar in meaning to the U.S.' national motto "E Pluribus Umum"). The country was facing an economic meltdown and its currency was worth only 20% of its previous value towards the U.S. dollar (specifically during January through October 1998) which in turn also affected locally-produced products – a product that used to cost 1 now would cost 5 in local currency terms while the salary levels remained at 100. (Right photo sunset in Losari Beach, South Sulawesi, under the Philippines). This in turn created the increasing number of unemployed of up to 20 million people (from a total of about 90 million) because businesses were also affected. However, the resiliency, the inherent wealth of the nation, the large market potential of 220 million people making it the 4th. largest population nation in the world – and its past decades long growth performance – cannot be discounted and should provide for a light at the end of the tunnel in coming months and years ahead. The nation owns vast riches of all types of natural resources, from aluminum to zinc, and in vast quantities, because of the huge geographical area. Its 220 million grass roots folks are blessed with a tropical climate, fertile vegetation and if not for weather disturbances, should not have problems developing their agricultural capabilities and feeding themselves. It has done so in the past but was disrupted by the Asian economic crisis. A positive past performance – particularly involving decades – provides for confidence to be able to repeat a similar performance, in spite of ongoing 1999 difficulties. Indonesians still have the potential of making their country one of the major economic powers of the world–in spite of the Asian economic and financial crisis of 1998 and the expected global recession of 1999. To reach this goal, Indonesia must be better prepared for the future and have the necessary infrastructures like roads, power and communications, the absence of corruption and monopolies – government or otherwise, transparency in the awards of licenses and government contracts, and upholding the rule of law -- not as past practices the benefits of the law work only for those who have the funds to buy their way, irrespective of whether one is right, or wrong. Indonesians of all walks of life hope the present Habibie and future government administration will make these their major efforts and goals. The common people are concerned only with feeding their family, to have a good job, and do not really care who is the president or leader of their nation. This has been expressed in the U.S.A. towards U.S. President Bill Clinton, and to leaders in Japan, in Korea, in Thailand, and in Indonesia. All are only concerned on how well their leaders do their job of keeping the ordinary people's lives stable, and predictable. This grass roots community should be given the opportunity to better themselves through trade of their home grown commodities and to market their own agriculture produce and their home industries among themselves, with the other towns and cities throughout Indonesia, and thereafter to the international communities. This then provides for a strengthening of their local economies, in turn provide for better living conditions, and improved conditions provide for more types of businesses to grow and thrive. Because of the availability of this basic telephone communications service, the country will enhance its own communities by self-effort and self-determination. This self-capability will provide for resilience against an economic downturn because the majority of the population can always fall back on its own farmland and its own self-sufficient agriculture production should financial crises hit the country now or in the future. Had the government implemented this "national grass roots" growth program in 1988, the economic upheavals experienced by Indonesia ten years later in 1998 would not be as damaging to the common people as it is now. Had the common people be given the opportunity for self-growth through the availability of affordable and available communications services which act as a catalyst to all types of economic and administrative activities, the negative impact of the Asian crises and expected global recession in 1999 would lessen the sufferings of the common people, and therefore lessen the political upheavals which Indonesia was recently and now being subjected to would not negatively affect all businesses. Indonesia, like any huge country, is not perfect—it's more difficult to govern than most because of its vast geographical area separated by oceans and the diversity of its cultures, religions, languages and ways of doing things—and is recovering from S.E. Asian monetary woes. As a demonstration of support for its economic future, its 220 million-plus market potential, and what it can give in return to the global economy, IMF Managing Director Michel Camdessus in a press briefing in Washington, D.C. said on October 31st., 1997, stated bilateral donors—Australia, China, Hong Kong, Japan, Malaysia, Singapore and the U.S.A. in addition to the IMF, the World Bank, the Asian Development Bank, intend to correct "the excessive depreciation of the Rupiah, and they would act again if needed". In addition, he stated, Indonesia is "to use its own substantial external assets"* (The "substantial external assets" referred to are multi-billion gold bullion assets kept in major foreign banks and foreign central banks owned by Indonesia.). For additional information to these assets, please refer to articles written by Lena Soares, “Listen to East-Timor”, article no. 14. *Quoted from the IMF managing director in press briefings and other agency reports dated 31st. October, 1st. November, and 10th. November, 1997. In spite of the economic crisis which all Asian countries are facing, international business and an escalation of diplomatic ties have spurred the growth of 42 international schools throughout the country. The establishment of these schools is based on a 1975 agreement by the Ministry of Education & Culture, the Ministry of Foreign Affairs and the Ministry of Finance. To oversee the development and operations of the school, the government has set up a team comprising of the Ministry of Education & Culture, Ministry of Manpower, Ministry of Foreign Affairs, the Ministry of Justice and the Ministry of Finance. There are 14 in Jakarta, 9 in West Java, 3 in East Java and 3 in Irian Jaya. Some of the 27 provinces have one international school each in Aceh, Bali, Riau, South Sulawesi, West Kalimantan and Jogjakarta. There are also special international schools which cater to citizens of India, Korea, Singapore, Japan, Australia, Germany, Britain and other countries. These schools currently have 10,829 students, 895 foreign teachers and 181 local teachers. They fall into 3 categories: (a) diplomatic schools, (b) mixed diplomatic & international schools and (c) international schools. Diplomatic schools by a country’s embassy and its students are children of diplomats and its citizens. Mixed diplomatic and international schools are attended by children from a number of countries and are supported by the embassies and parents of the students, and international schools are established by foundations to accommodate expatriate children whose parents are working for companies in Indonesia. AIS Jakarta (62) 21-780-5152, 21-782-92-36 to 38. Cilegon International School, Cilegon, West Java. CJIMS International School, Salatiga, Central Java. Do you have a website with these themes below? Your experiences may help and give others pointers. Link to this and 30 of our other sites and ours to yours?